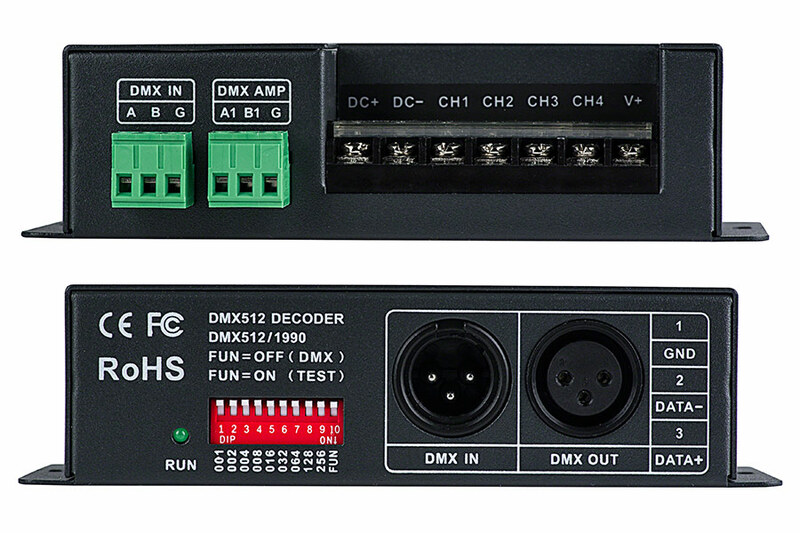 DMX-4CH-5A 5 Amp 4 Channel LED DMX Controller/Decoder: Connected To A RGB LED Source. 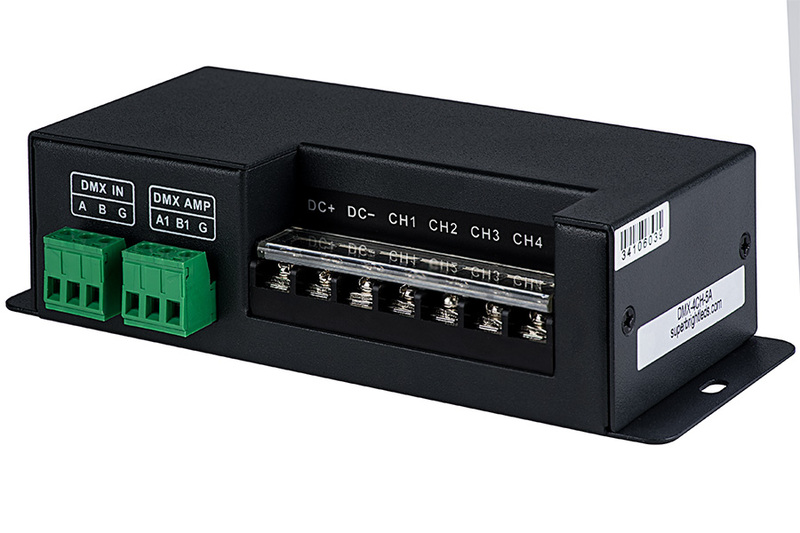 This 4 channel DMX512 decoder can control up to 4 different 12 VDC LED products or any 1 RGB LED light bar or strip. 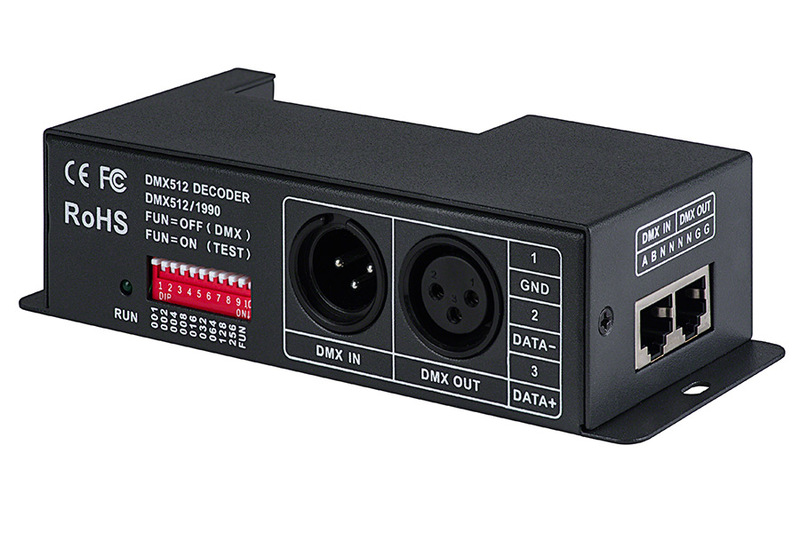 Decoder can run in stand-alone mode using Address code switches or under DMX512 digital control signals using XLR or RJ45 DMX512 Input/Output interfaces. DMX decoding driver converts universal DMX512/1990 digital signal to PWM signal, which can be controlled by DMX512 console with 16-bit gray scale output per channel. Maximum load is 5 amps per channel—20 amps total. Includes male and female 3-pin XLR connectors. 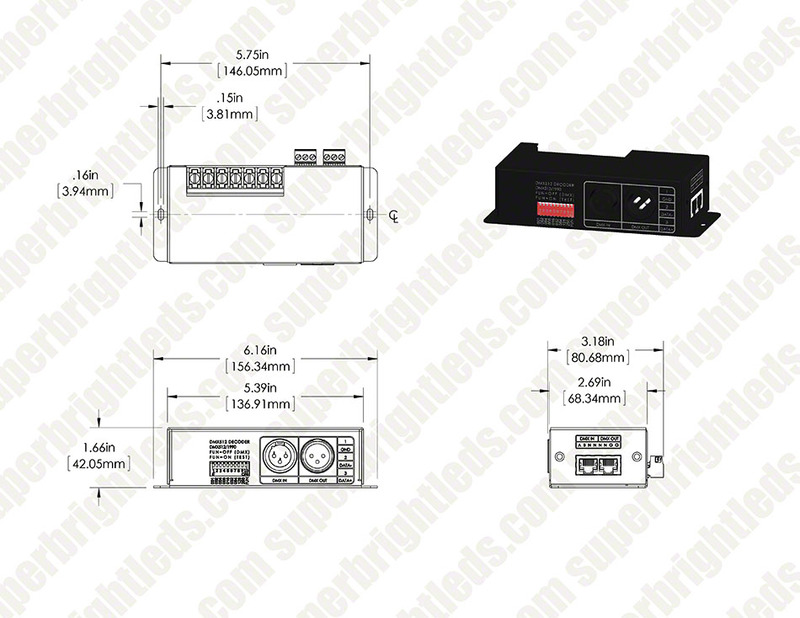 The Model DMX-4CH-5A can run on stand alone mode or under DMX control. It receives standard DMX-512 digital control signals and converts to PWM (pulse width modulation) signals for driving LEDs. Connect to any DMX digital console to achieve dimming and and various color changing patterns. 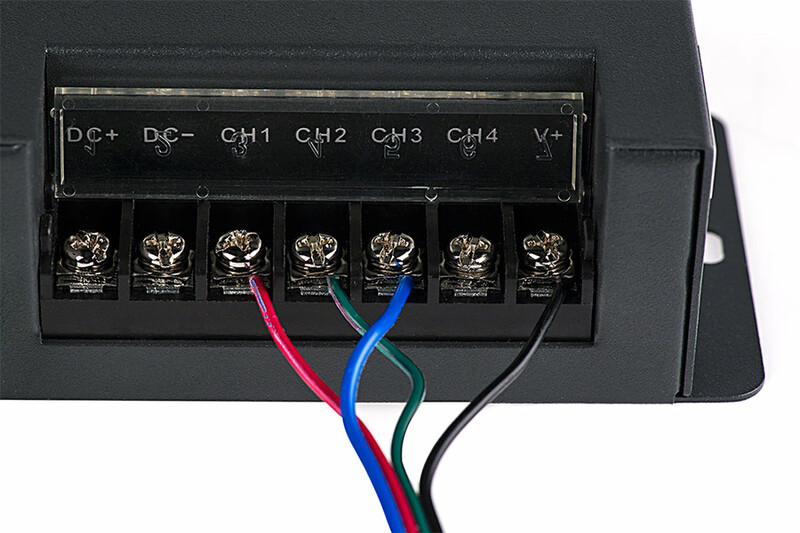 DMX512 initial address code is equal to the total amount of the DIP switches numbered from 1 to 9, Placing the DIP switch in the DOWN position sets it’s value to ON. Placing the DIP switch in the UP position sets it’s value to OFF. Example 1: Set initial address to 37. As figure 2, set the 6th, 3rd and 1st bit of the DIP switch downward to “1”, the rest to “0”, the total sum from 1 to 9 is 32+4+1, so the DMX512 initial address code is 37. When FUN=ON, Decoder is in self-test mode. Example 2: set initial address to 328. Set the 4th, 7th, 9th, bit of the DIP switch downward to “1” the rest to “0” (as Figure 3) the summation from 1 to 9 is 8+64+256, so the DMX512 original address code is 328. This lighting fixture is only suitable for a 12~15volt power supply. This LED lamp is a highly efficient, extremely low wattage, energy-saving product. However, it is not recommended to use a power pack/transformer over 100 watts. Use shielded cable for outdoor use in the following sizes: 18G, 16G, 14G, 12G. Do not repair or modify this product. Risk of fire or electrical shock. Read all of these instructions thoroughly before use. Keep this instruction manual in a safe place for future reference. Do not install or connect wires with wet bands. Do not install this product within 10 ft. from a pool, spa, fountain, or other body of water. The fixture wire and primary cables are intended for shallow burial - maximum depth must not exceed 3 in. For low-voltage landscape lighting systems only. Do not step on or drive over the branch cable or power cable. The Website says this has 16-bit grey scale control and I ordered these based on that information. When they arrived and I tested them, they were only responding to 8-bit control. Upon clicking the link for the Manual, I discovered it was only 8-bit/256 grey levels. Customer Services was excellent in assisting me in a return. We regret the misinformation and will correct the content. 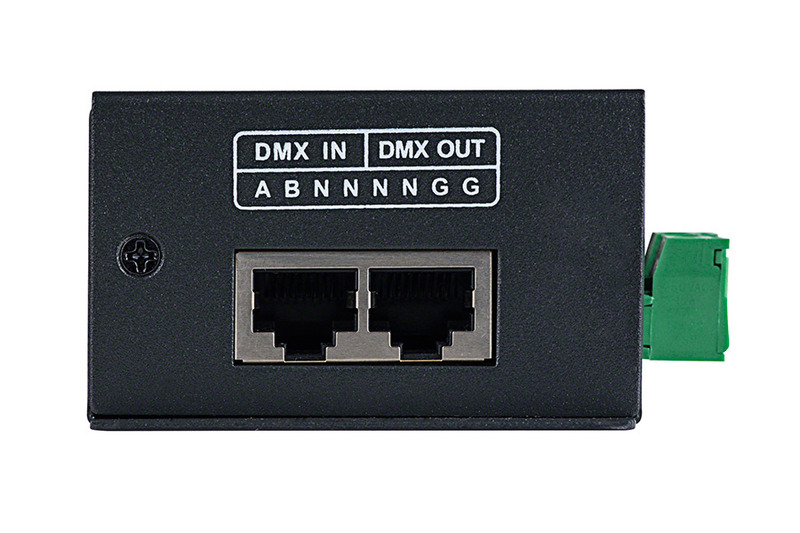 For 16 bit DMX controllers, please see our DMX-5CH-8A, or the DMXD-RGBW-5A .